And don't miss the FREE Terial Magic giveaway at the bottom of this post! Not to get sassy with you, but it’s exactly what it sounds like! 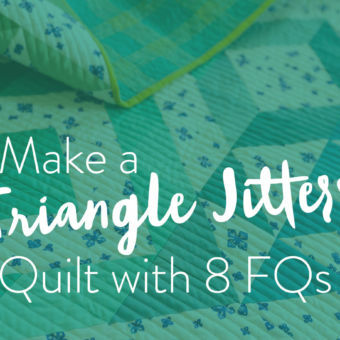 It’s something you use to stiffen-up your fabric to make it easier to work with, especially when you’re quilting or embroidering tricky designs. Technically, stabilizer is different than interfacing. While interfacing is meant to be permanently added to your fabric project, stabilizers are meant to be removed after sewing. Cut-Away. This stabilizer keeps fabric stable while you're sewing, until it becomes of age and you kick it out against its will… with scissors. AKA – you cut it out. Uncle Joey style. Tear-Away. A little less clingy than its cut-away sister, tear-away stabilizers can be carefully yanked from their post. Carefully. Some tear-away stabilizers are more cooperative than others. Heat-Away. If you’re working with delicate fabric and you want to do as little yanking and cutting and washing as possible, you might have tried heat-away. Put this baby in a steam room and watch it crumble under the heat. 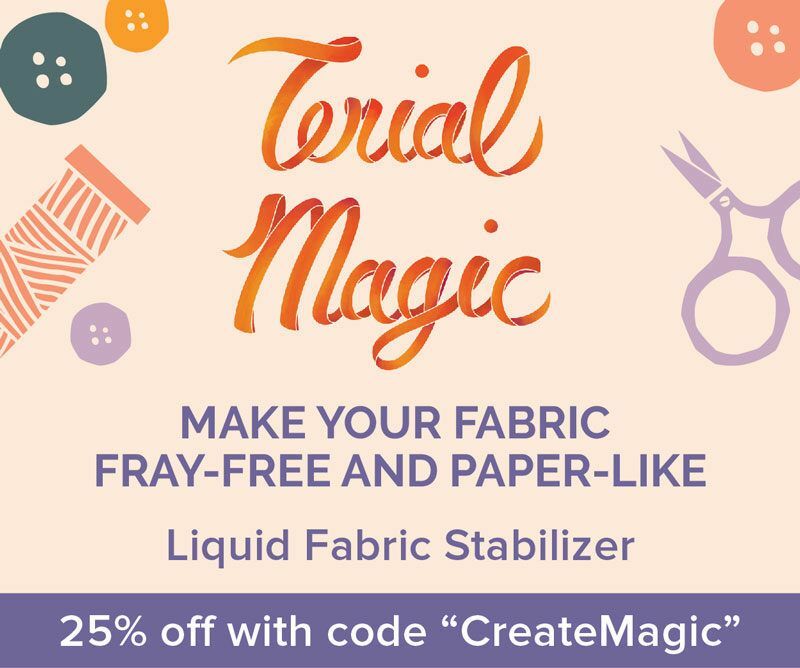 Speaking of washable stabilizers...have you met my new friend Terial Magic? It's a unique liquid stabilizer that transforms any kind of fabric into stable, paper-like material. Wait, let me stop you right there before you ask, "Can I use it on [insert every type of fabric ever made]?" Cause honestly I'm not sure. 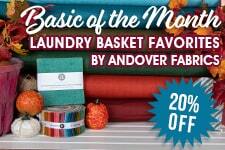 I can personally tell you that it works great on cotton, jersey, linen, denim, and chambray. Does it work on silk? I haven't tried it. My guess is yes, but like I always say – test, test, TEST! 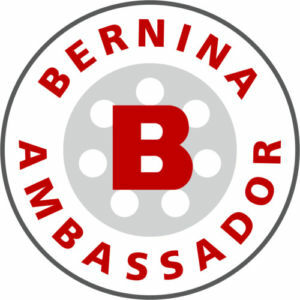 FYI, this post is sponsored by Terial Magic, but I assure you that I only partner with companies I like and trust. Always wait until the very last minute to print my quilt labels. Spend 10 minutes creating a perfect 8 1/2" x 11 freezer-paper-fabric situation. Run around the house yelling at my printer for eating up the freezer-paper-fabric situation I have been cramming into it for 30 minutes. Make at least two more fabric-freezer-paper-fabric situations so I can try once again to print my labels after the first one was ground into a pulp. First by my printer and then by my fist. Force my husband to sweet talk our printer into printing JUST ONE, PLEASE LITTLE PRINTER, JUST ONE label. Crawl into bed clutching my hard earned printed bits of fabric two hours later. Guys, you wanna know my routine now that I own some T-Magic?? Always wait until the very last minute to print my labels. Spray T-Magic on some scrap fabric. Wait 10 minutes for it to dry a bit. Send it through my printer. Celebrate my amazing success at printing a custom label. I can't believe I'm actually going to put this in writing, but printing quilt labels just got FUN! EDIT: After originally posting this I got a lot of questions about whether or not the ink from your printer will fade. I personally haven't washed any of my labels yet, so I can't tell you for sure. My guess is that it has a lot to do with the kind of ink in your printer. If you don't want to risk fading, there is a chemical you can buy that will set the ink into your fabric to prevent fading. Again, I haven't tried this, but it sounds like a great solution. I've also just gotten another tip from a reader – if you soak your fabric in vinegar, then rinse with water, and finish with ironing, the ink sets really well. I think you should test a few different things and report back with what works for you! 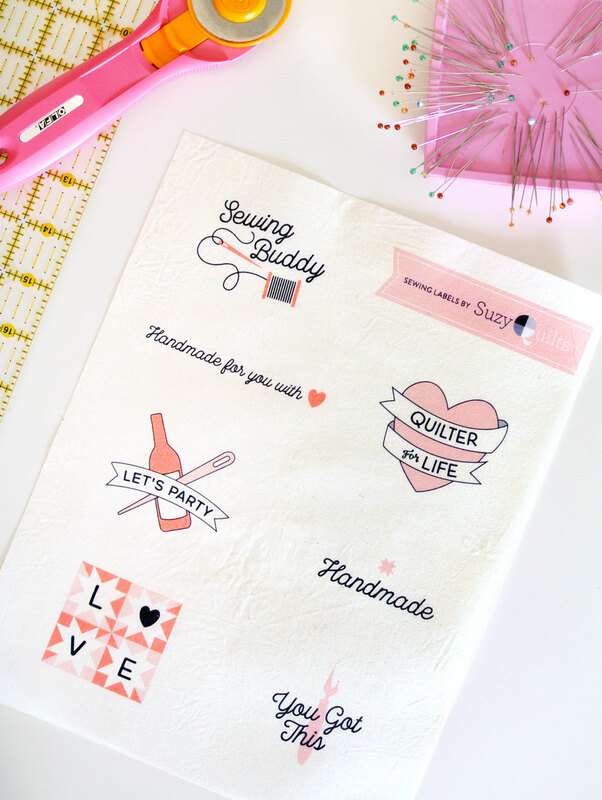 Click here to download your free sewing labels! Spray your fabric until it is soaked through. Dry it until it's damp. Trim it to 8 1/2" x 11 (standard for printers in the USA). Treat this stabilized fabric like card stock. For my printer, I needed to load it in the back tray. 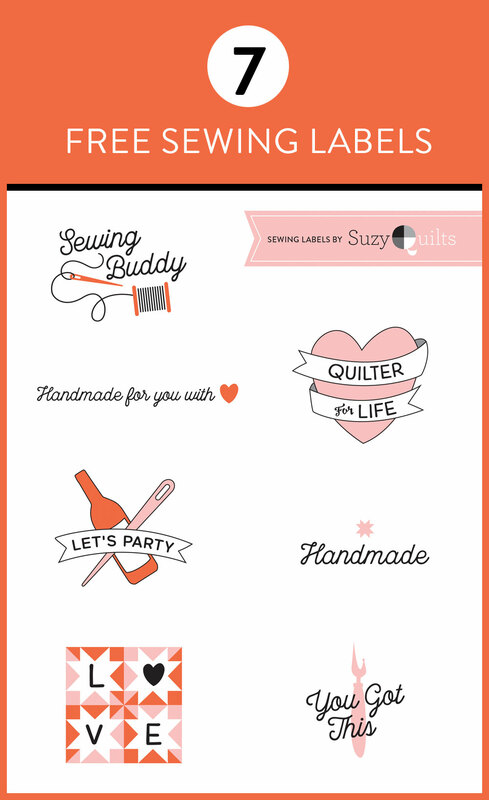 You can use these labels on your quilts, as patches on a jean jacket, as cute additions to a collared shirt, fabric cards for friends, or maybe even as bunting to hang in your sewing room! Whatever makes you happy! You could also do some needle-turn appliqué and sew one like a patch on your next quilt! Go to the Terial Magic blog. Find an interesting project you'd like to make or that has inspired you. The 10 winners will be announced 1 week from now on April 5. Campfire Quilt Pattern – Tips, Pics & Fabric! 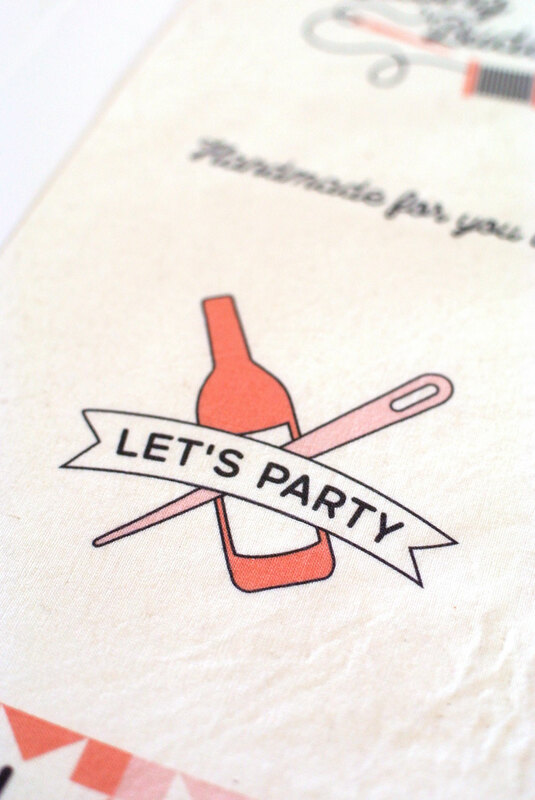 Can’t wait to try out some Terial Magic with their reusable fabric party decor tutorial! I would definitely make some pendant banners. I love party planning and making decor! How cool is this spray!! I have to try it! The printable family eic pennant banner looks like a fun project! I totally want to make a pennant banner now! The onesie project looked super cute! I’m definitely going to get me some of this- what a time saver! I like the baby onesie fabric printing idea a lot but also my cousin has asked me to make a specific appliqué quilt which I have not done before. Will probably come in handy! I looooove pennant banners so that idea stood out-would love to try that for my nephews birthday party! I am always looking for the best way to make labels, so am anxious to try this method. Hard choice!! I’m leaning toward the fabric pennant banner. Can’t wait to try this!! Wow I must have been looking for Terial Magic all my life! My students will love it…7th & 8th graders. They’re excited about cutting any geometric shape of fabric for their quilt art!! I like the reusable party decor! So cute! Maybe I’ll even make some for my sewing space. I would love to try this out on the quilt I’m working on for my mom! I’m excited to use a really special label for her and this would be super helpful. This stuff sounds amazing! While I’m really interested in it for labels, because … SERIOUSLY … I’ve got 2 baby quilts here I haven’t gifted because – LABELS … the pennant project looks cute too! Time to get something done! This would be so helpful with EPP! It’s been something I have wanted to try but working with little pieces of flimsy fabric scares me! I would use it for labels. I always have trouble getting my freezer paper through the printer. I waste a lot of fabric that way. This seems like the perfect answer! I want to make some customized onesies for my baby boy. Wow! Magic! The banners look like fun! And postcards too! Thanks for sharing your infinite wisdom, Suzy! The birthday banner looked fun! I always love making quick personalized decorations for get togethers. So many different applications for the Terial Magic . . .the fabric postcards look like fun. Also, the pennant banners could be made with unique fabrics for each of the holidays from Easter to Thanksgiving. It just looks like you are only limited by your imagination. So much fun!! OOohh Those Fabric postcards would be super fun. Love it! I will definitely be trying this product. It gives me courage to give reverse appliqué a shot. Ohmygosh ohmygosh! Is this really the answer to all my label making (or lack there of) woes??? I have a product called bubble jet, but the process involves soaking and something else over a longer than I have patience for time period, so I haven’t tried! How does the actual text hold up over many washes? Like a quilt that is used? A pennant banner from heir blognis definitely in my future! I really love the tote bag project for customizing! Wanting to do this but printing on fabric has not been a thought. Also label printing is on my radar now! This stuff sounds crazy! I’ve always wanted to toy with using fabric for origami, and this just might make it happen. If folding flowers doesn’t work, those fabric orchids on the blog would be a beautiful project for spring! I’ve been wanting to make a memorial t-shirt quilt. After reading that knits treated with stabilizer may be easily sewn, I finally understand how I can do it. I was definitely inspired by the improvisational strip quilt without a pattern. I can see how the spray helps when cutting on the bias. I’d also probably try EPP with this too. Can’t wait to try it! Oh my gosh, I’m dying to try this stuff! Never heard of it before! While perusing the blog, the fabric flowers for your hair caught my eye and look adorable. I can already see myself making these in all different colors for all the little girls I know!! I love that Apple blossom and promises quilt pattern/tutorial by Laurel Anderson! The fabric post cards look awesome! And easy to make! I love the pennant banner! I was planning to make one anyway, but the Terial Magic will make it SO MUCH easier! Thanks Suzi! Wow I love these. 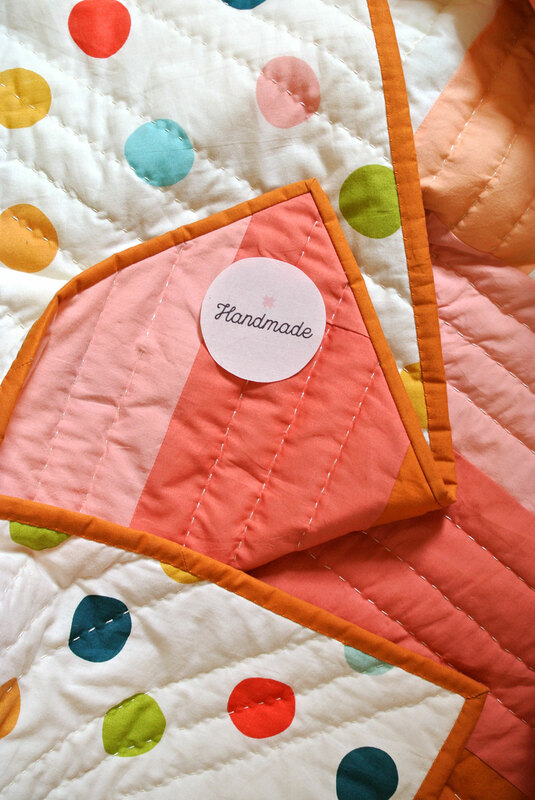 I love the strip pieces quilt from the blog! Oooo! I want to try all the things! The flowers look particularly fun! My girls would LOVE to make the flowers on their blog!! 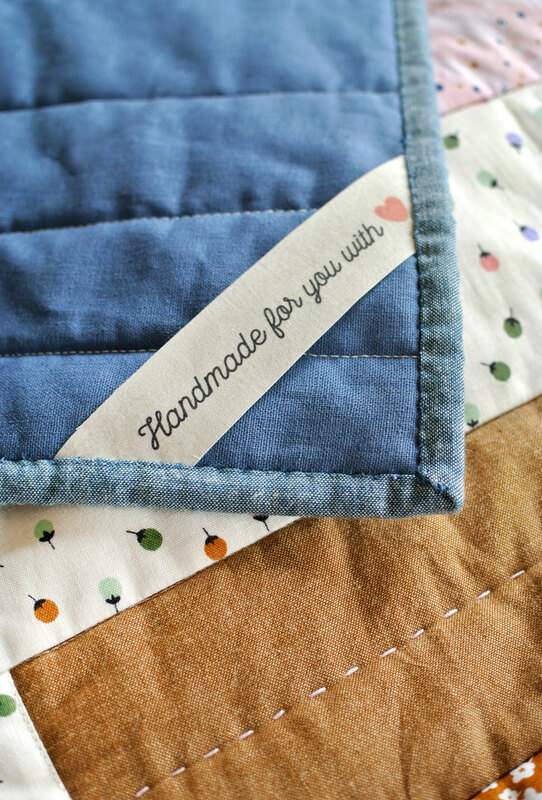 An quilt labels—seriously, your timing is always perfect! I was just researching them, so this was the perfect post to stumble across today! Fabric flower cards, printing on a onesie, fabric pennants, etc…??!!! It all sounds awesome. I honestly want to try the printable fabric labels the most. However, if I had some of this magic stuff I could get crafting crazy! Fingers crossed for this win! “Force my husband….” yaassss this is me. For better or worse right?! It’s like they have magical powers and can make all the things work! He loves when I wait until the last minute, even though he may not know it. Fabric flowers to cheer up my apartment! Fabric postcards sound like a great project! Terial Magic sounds great for labels and using coordinating fabric. Thanks Suzy! 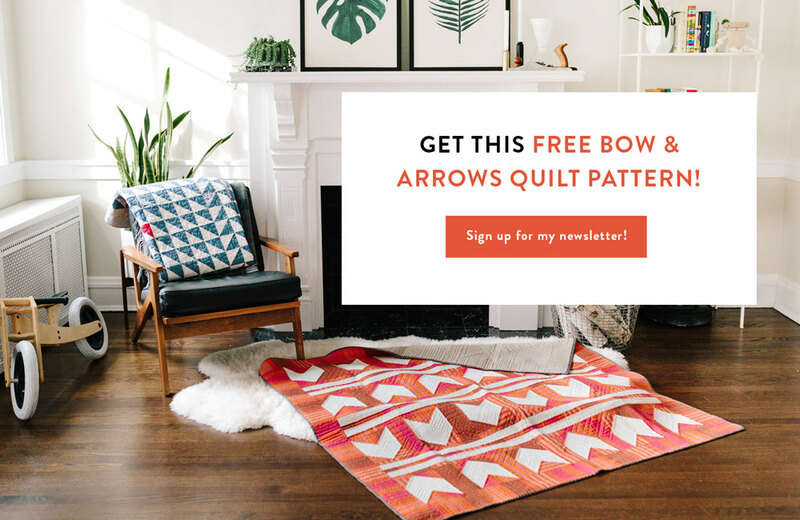 I ❤️ that Quilter for Life logo…now if only PatchworkThreads would do another run of that tee…in navy…pretty, pretty, please!!!! This will be perfect for labels on all my wedding quilt gifts I have this summer. #weddingseason #whydidIagreetoquiltsforall. Fabric postcards, sewing with lace, and pennants are what sticks out to me, i want to do all these things but they scare me… it seems like it would be a lot easier with Terial Magic! The postcards!! I’ve always wanted to send fabric postcards! But also I neeeed this for quilt labels so bad!! I’d love to make the pennant banner. I have another homemade one and it’s just not great. This technique would make a way better banner. That Terial Magic seems like it has so many uses, but I think I would use it one the onsies!! Sounds like a great product! I’d love to try it for label printing, but I also liked the ideas they had about using it for strip piecing and to personalize clothes. Sounds like a really heavy starch in some ways, so that would be awesome for bag-making, too. I’m intrigued by the hexie curtain. A new way to do EPP without the paper! This sounds like a great product. I will be making a t-shirt quilt soon and would love to try this on the jersey t-shirts. I’d also like to make some printed quilt labels. Thanks! I really want to try some of that reverse appliqué on knits! Been wanting to do Alabama Chanin stuff for years… this spray would make the process extra fun! Terial Magic would make English paper piecing magical! I love the pillowcase project. My throw pillows have definitely better days, but they are so expensive to replace! I need to stop the random, impulsive projects and conquer these adorable pillows! Oh and your labels! I am making a quilt for my best friend as a surprise and one of your labels would be the perfect addition. There are actually several projects I’d like to make/learn about including printing on onesies, reverse appliqué on knit, printing on fabric, and the quilt pattern to celebrate love since I have several friends getting married soon. #1 Fan Tiffany! hahaha! You’re the best. I would absolutely love to make fabric postcards! And quilt labels—your saga with freezer paper sounds exactly like mine every. single. time. !!! I loves the customized totes, and banners. Anyway I can make something with my kids names on them. I would love to try the faux fruit project. I’ll definitely be looking into getting some Terial Magic. Thanks! Sounds like a great project. I like the orchid flowers! I love the flower projects! Be so cute to make barrettes for my daughter. I would love to use it for paper piecing & creating your adorable labels! This stuff sounds amazing!! Oh my goodness! This looks like a serious game changer! That banner will be adorable to wish my 2 year old grandson a Happy Birthday! I’m intrigued by this. The strip quilt post has my wheels turning. What a fun product. Thanks for the info! I would make the Reverse Applique Sewing Machine Cover and Sewing Organizer! I love the idea for the pennant banner! A nice improvement over flimsy fabric banners that don’t deliver the visual punch. I would love to learn “How to Print on Fabric to Customize a Onesie”. I loved the fabric bunting that used the Silhouette. Tack that under the growing list of why I need one of those! Can’t wait to get some. I am so behind on labeling my quilts. this looks like the thing to have. I would love to make some of the Terial Magic flowers for my granddaughters hair. My girls would go crazy over the hair clips with flowers on them! 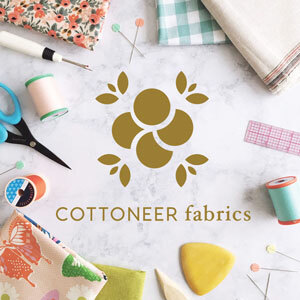 The DIY reusable fabric party decor is speaking to me as I am currently planning my daughters first birthday and would love to do some handmade/diy decorations for it. Would absolutely use for quilt labels , just a bit confused?? Does this product help set the ink?? I’ve done some printing on fabric only to have lost all the image once washed.. If the ink stays I will for sure be trying this! So many cute ideas love the post cards! I don’t think this spray helps keep the ink intact. However there are other products that do that. This chemical sets the ink so that is doesn’t fade. I think the fabric labels are a great idea!! And the accordion fruits are pretty cute too! I would love to try the EPP hexie curtain project. Ooo – a birthday banner! I love the accordion faux fruit! And so many other uses for Terial Magic… Thanks for pointing it out. Wonder if it’s available in Canada yet? That printed pennant banner looks fun! I have a question about ink-jet labels for quilts. How sturdy is the ink jet ink through washings? I’d love to make my own labels, but would hate it if the ink faded after just a few washings. I love that I can make labels for my quilt! Can’t wait to try it. What a wonderful addition to any quilt!! 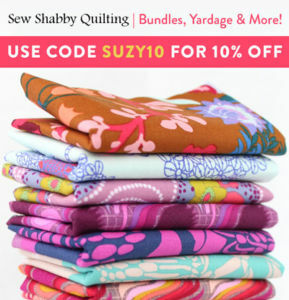 Suzy, what if you cut your 8-1/2″ x 11″ fabric on the bias before you stabilize and print it? Would that prevent fraying? That would help, but I think eventually cotton would fray. You could make a jersey label and that wouldn’t fray! Hooray! Where do I begin. So many options for this “magical” solution. I love the idea of making my own labels and with my daughters birthday just around the corner; the fabric pennant is just perfect! Loving thw fabric postcards. U have a LOT of fabrics & ideas that would be PERFECT fir thus plus I get ti inexpensively let friends & familt know I’m thinking of them! Ohhh, I love orchids so I’d have to try that fabric orchid project. So neat! I’ve never heard of this stuff and definitely need to check it out. i would use that magic doing their machine reverse applique. I love the look of reverse applique but i do it all by hand. I am intrigued by the idea of doing it by machine. I did not realize there were so many things you can create with this product. 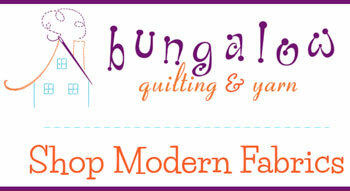 I plan to make quilt labels and can hardly wait to make a pennant banner. So many cute projects! I especially like the quilt labels and the pennants and banners! WOW! Seems so cool. I love their stamped gift bag! It’s really cute. The strip piece quilting will probably be my first, but those postcards have given me some ideas for some special fabrics I’ve been saving. I NEED to make the sewing machine cover. My current “sewing room” is the kitchen and I would love for it to be cute! 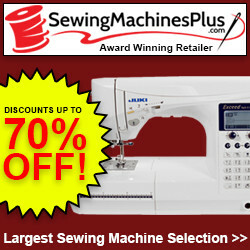 I would like to make the Reverse Applique Sewing Machine Cover and Sewing Organizer. 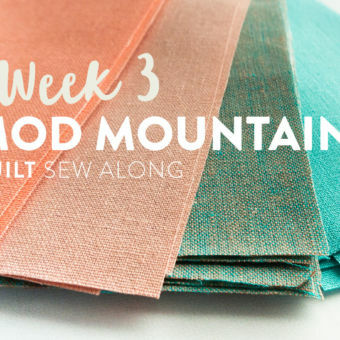 I do EPP and would love to try this method described in the blog! Seems quicker. I am so excited about trying Terial!! The postcards and dragonfly just blew me away..and so many more. Terial is something I would love to try!!! I bought some and can’t wait to try it. You are so funny and I am just like you in the first label making example. Thanks for this post! I am anxious to print on fabric. What a clever way to personalize! The 3D flower card looks like a cute project for Mother’s Day! I’m totally an EPP fan. I heart the paper piecing method. I would love to be able to see what adding the fabric stabilizer to that process would do? – But then there is also the fabric flower/orchids that are enticing…. My mind is going about a mile a minute with possibilities. I’m glad I clicked over on the terial blog today! Inspiration overload! 😀 woohoo! Thank you Suzy! What a fantastic product! I am thinking of banners and onesies. It would be great for appliqueing on onesies and keeping them soft. Other stabilizers can be too scratchy for an infants clothes. Bunting decorations sound like fun, but fabric labels would be my #1 project for some terial magic! I loved the idea of the handmade fabric banners!! How cute. I must try this soon. It’s hard to pick only one! I’m already planning some things from the ideas on the blog from the fabric postcards, I really like how they used it with lace, made me want to use it in a collage …I’m thinking about buntings now and my daughter would have so much fun with the flowers and rosettes. What a great product! I’m so glad you told us about it!! Would love to try out the flowers! I can use this on T-Shirts!?! My pillow making to match T-shirt quilts just got a whole lot more exciting!! Thanks so much! Stripped pieced quilt without a pattern. I love the way this quilt looks. I usually don’t use patterns anyway, but I want to make a quilt like this one. I love the colors. I’d love to make some fabric banners – was going to do it but was wondering how to keep them stiffer and not so limp on the line!! Thanks for the label making idea – really nice! I wanted my own labels but they are expensive to custom order!! I have been working on a lot of triangles and diamonds lately and realized sizing is my friend. BUT I am always willing to try new and better things. This stuff looks amazing and the thought of being able to print custom labels on real fabric sent my brain into overload. I absorbed all your information on labels as well as what was on the Terial Magic blog. Then the dragonfly and the tee-shirt quilts….oh my! That’s a tough one!! Several really caught my eye…but the one I’d like to do is the Reverse Applique Sewing Machine Cover & Sewing Organizer, for my serger. The table I keep my serger on has the dials right at the eye level of my 2 year old granddude. Yep…he tries to sneak in my studio after his nap and ‘play’! So many cool projects! I’d love to try Terial Magic Thread Painting. That’s something new to me! This looks like a really great product. I want to try it for quilt labels first but I can see lots of uses for it. Sounds like an awesome product. Love all the ideas on their blog and think one thing I would like to try is using it for stabilizer when I make a tshirt quilt. The Fabric Flower Card is so cute! I want to do that for birthday cards! I would love to try the Life-Like Dragonfly project. There are several others that are exciting to contemplate. Your label experiences with freezer paper cracked me up! You are hilarious. There are lots of projects to try, but I gotta say printing labels will be my first try with the Terial Magic. Not more freezer paper for me! So excited to try Teriel Magic for the fabric orchids. I am making a diaper cake for my soon to arrive grand daughter and the fabric flowers will be perfect for the finishing touches! I’d like to try Customizing a tote bag. I’d like to try Customizing the tote bag. SO many choices, so little time! I have a new granddaughter who turns one at the end of April. I’m waiting for her hair to grow out so I can make some fancy barrettes with flowers, like the ones on the blog. i would love to try fabric postcards! how fun would that be to receive in the mail??? I have gathered several patterns for a customized tote bag and would love to personalize it. I also love the gift bag option – what fun! English Paper Piecing is a skill that is next on my list to learn. Also more quilt as you go. I think that some Terial Magic would be a good thing to have!!!!! Thanks!!!!! Omg, this stuff looks so amazing!! I would definitely make the party decor, could even be cute year long in my sewing room!! I don’t see a project on the blog, but I make quilts for the Army National Guard Units that my son is over for the spouse when there is a loss or retirement. I make flag quilts that have appliqued stars on the blue background. Will it work for that and does it wash out so it is not stiff like iron on stabilizer? The Keepsake postcard fabrics is something that I would love to try. Since I have traveled and lived overseas for many years I have lots of postcards that I have collected. They would make lovely purses for the family or a wonderful quilt for my sweet Granddaughter. I am inspired to make the fabric postcards! Who doesn’t love receiving something special in the mail, especially since it’s a dying art. Thank you for hosting a giveaway! The cards and envelopes. I have so many scraps I could use! I’m halfway through an EPP hexi quilt–Terial would have made it so much faster! I’ll use it for my next one! I love Terial Magic for a Sue Garman quilt I am making with reverse applique. It has lightened my work load considerably. I want to try the hexie curtain next. Wow! Love the stuff so much!!! Love how she made the dragonfly! What an awesome way to create 3-D art to put on my quilts! Loved the article on personalizing a onesie! I always enjoy when the things that can go wrong are shared so that you can avoid making the same errors. This would be great help making the-shirt quilt for my grandson. Would love to try them all!! The fabric postcards definitely caught my eye!! I live the labels you provided. But excited to attempt to design my own and print them to fabric…awesome! I found the Reverse Applique Sewing Machine Cover and Sewing Organizer interesting as I’ve been wanting to try one of Alison Glass’s reverse applique patterns. I’m excited to try Terial Magic! Love the DIY birthday banner idea! 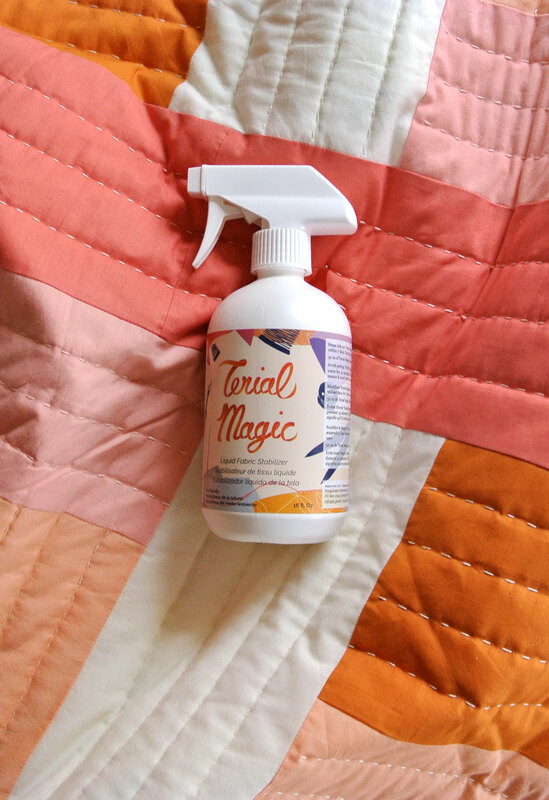 Can’t wait to try Terial Magic – it sounds magical! Can’t wait to try Terial Magic! I want to use it for labels and for other fabric designs. I love it for labels, but those fabric postcards would be an amazing project too. I’ve never heard about this but I like it! I would like to try it by making the How to Make a Fabric Flower Card for Mom. Looks interesting! I love the idea of printing my own onesies since all my friends are having babies and I would always rather a customized gift. Really excited to try this product and make my own labels. I’ll be so fancy. I like the apple blossom quilt, this looks like a product l could use , really want to try it for quilt labels. I would love to win tarial magic and try out both the machine cover and labels for my quilts. But first I have to work on a brides and her 3 bridesmaids dresses in the next 4 weeks to work my own magic first and then ill be ready to get back to my quilting. What is the font you used in your labels?? So cute! Specifically, the “handmade” copy fonts. So many project ideas! I like the Strip Pieced Quilt w/no pattern and the banner ideas. Love the sewing machine cover and organizer. So practical and pretty, and their tutorial is great with lots of pictures! Y faughter’s College graduation is coming up, so a banner personalized with her name would be perfection! Want to try the fabric postcards! Will be so much fun to post them! The fabric postcards look awesome! The butterflies and poppies are so cool. I am on the Fine Arts Committee for my church and we love to hang stuff from up above. These butterflies would be so cool during Eastertide. I love this and the orchid postcards! Both are awesome! I would love to make a new reversible sewing machine cover. My current one looks soooo dated. But then so is my everyday machine from the 70’s. An Elna SU that I wouldn’t trade for anything. I’m very interested in making the reversible sewing machine cover. Thank you so much. Terial Magic sounds like it has so MANY applications. Looking at the blog, the pendant banner has me fascinated. Think of all the fun banners you could make for kids’ parties, holidays, gatherings. Right now I embroider all my quilt labels. We have a laser printer. I think you need an ink jet printer to print on fabric. But to print a label “at the last minute” would be great. Would enjoy trying this product and, if I don’t win, where could I purchase it? Quilt labels, onesies, postcards, fabric flowers, strip pieced quilt or maybe I’ll just try one of each project. Suzy, I just love finding one of your e-mails during my lunch break at work. It takes me away from all the stress! I would use Terial to customize fabric and make my own tote bags! Some inspiring quotes with my own handwriting over gorgeous solid fabrics! I would love to make a birthday pennant banner and I’d like to try those quilt labels in your post… they would add a special touch. Fun!! Beside labels (of course) I’d like to try the fabric flowers! I like the fabric banners and would love to make some to string across the wall in my son’s room. Monster fabric. In green. The 5yr old knows what he wants! I would try to make the geometric pillow… I don’t know why but I’m really wanting to try to make some pillow covers. I’ve been saving (hoarding, whatever) T-Shirts for like 6 years now and this would make a great project for them!! Of all the exciting projects, the minute I saw the fabric flowers I knew that my four great-granddaughters would love them, so they would be my first choice. I can think of so many ways to use this product. 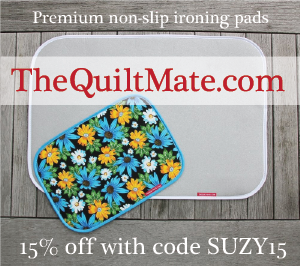 On quilts, garments and especially for anything I will sell. I can put my site or name or email or anything on a special label. Can’t wait to try it. I would like to try making the Keepsake Fabric Postcards. They look like such fun and a special way to brighten someone’s day. Ah! I’m so into the fabric pennant! I love the sewing machine cover and storage organizer. That is what I would like to make. I’ve been thinking about making some kind of family banner. 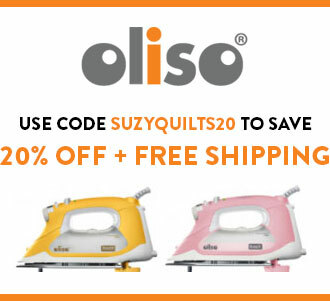 Absolutely want this for making quilt labels! Handwriting them is the worst! I would love to make them in one attempt rather than multiple tries. I would love to make some fabric labels! I love exploring fabric art. I have taken a thread painting class with Monique Kleinhans. I would love to try Terial Magic for thread painting and 3D effects for art quilts. Also the labels have me curious. Thanks for the giveaway. 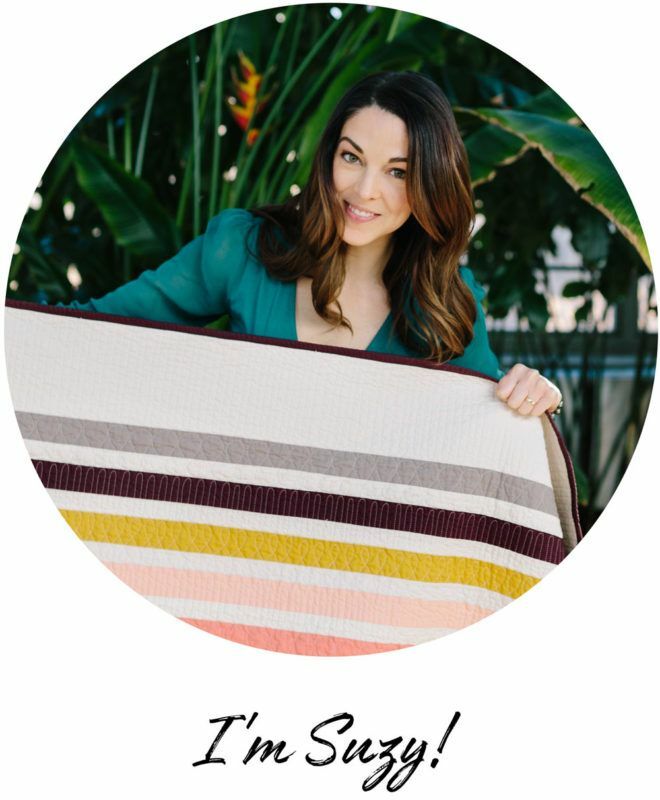 So I have been looking for something for some pillows I have on my couch and found the geometric pillow case in you blog, I love this pattern and can’t wait to get the fabrics I need for it. Thank you so much. Gosh! So hard to choose! Fabric flowers, reverse applique, banners, they all look so fun to make! Thanks for the info about Terial Magic! I want to make some fabric postcards. Thank you for the information about Terial Magic and the giveaway. Fabric Labels for quilts, projects. Woow I can do that:) Thank you both for all the tips and I’ve just got to try Terial Majic! Wow- I found one idea right away and then I made a common mistake: “I Kept Looking”. Now I have to choose. I am an avid EPP’er so I’m going with the EPP curtain. This is a whole new process for me but still hand sewing, which I love. Thanks for another great find, Suzy! Besides the quilt labels (very slick, btw! ), I’d like to give the pop up flower card a try. Very nice! Thanks for the chance. I love the fabric flower card for mom on the terial blog! My mom is a huge gardner and that would be a great Mother’s day card. I can’t wait to make postcards and to try it on a t-shirt quilt. How to Print on Fabric to Customize a Onesie is what I’ve been looking for! I bought some onesies yesterday and have been searching for the perfect tutorial 😊 This spray looks amazing, would love to win! I’ve seen a quilt shop use this stuff in order to cut out all the pieces of their quilt (Farmers Wife) using a Cameo machine. My goals aren’t so lofty -I’ll make fabric postcards. It’ll be easier to sew through than a bunch of stiff interfacing. Thanks! Have been wanting to take on an EPP project. Looks like this would be a great help! Finally a way for me to make a quilt label in an easy way without spending an arm and a leg to have printed or…spending oodles of time. Thank you, thank you for this information so my quilts will finally get the labels they deserve. I love the printable fabric pennant banner. Thanks for all of the helpful tips! I think I’d like to try the Dragonfly Using Terial Magic. That looks fun. Ok, labels are always an issue, agreed, but there are several posts I want to read and learn about this product. Would be fun to use in card making too, I think. Thanks for the post. Fabric postcards all the way!! I love getting snail mail and these would be so nice to send for birthdays! I also like the idea of fabric orchids because I love gardening but kill everything I bring into my house. Seriously, I killed a cactus once. Fabric plants to the rescue! I think the labels sound especially great. I have never used quilt labels or washing labels and being able to print the information onto fabric treated with Terial Magic sounds like such an inventive way to do it. I can’t wait to get some Terial Magic to try. I definitely have this on my list to try. I have some lovely silk I’d like to make Iceland poppies with, easy quilt labels would be lovely, and I’d like to try my hand at tri-axial weaving like with Mister Domestic’s project using the Wefty Needle. I would really love to try this product on an applique quilt and post card and labels and flowers and the list could go on and on. Printing on cloth has been a dream of mine for ages – this is the 1st product that has given me hopes of doing this with good results. GIANT petals for fabric flowers inspired by the tiny orchids project. How long have I been looking for ways to stiffen giant fabric petals? Weeks. Why do I need to stiffen giant fabric flower petals? To make a hanging lamp shade flower out of brightly colored fabrics for a store display: Chihuly glass sculpture meets bold blossom = my next project. I might be an overconfident beginner but it looks crazy great in my imagination. Plus, I practiced saying “fray-free” three times super fast while writing this comment. the dragonfly would be at the top of my list. i read a lot of the projects and this stabilizer sounds amazing. One of my goals this year is to send cards, letters and postcards to family members and friends, most of whom are far from where I live. Those fabric postcards would be perfect, especially for the quilters and sewers! And hey, why not start a fabric postcard exchange with our quilty friends – we could then create a quilt from all the postcards we receive! Terial Magic looks like a fun ‘tool’ to have in my creative tool belt. I have always wanted to try some pennant banners. This Terial Magic looks like it might make them easier to print. I would love to try the EPP. Thanks for the chance to win this amazing product. Those floral embellished hair clips would be a hit with my daughter. Plus, we can make them together! The fabric faux fruit looks fun! this is so cool! 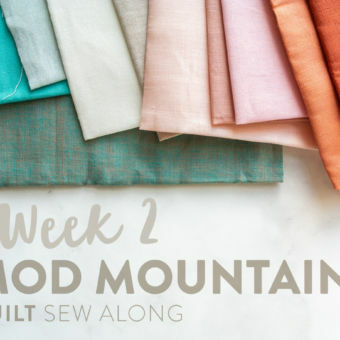 i’d love to play around with printing on fabric like you have for your labels, but i’m also really intrigued by the fabric postcards, the strip pieced mini quilt, and the EPP curtain. it looks like it can be used for SO MANY things! I just became a great-grandma [my grandson said I’ve always been a Great grandma] lol. So I’m eager to try printing on a onesie with Terial Magic ! The magic flowers and butterflies. They are gorgeous on the mannequin. I have so many things I could do with this spray. I loved the Reverse Appliqué Knit Wrap! These labels are great! The labels are definitely my choice. 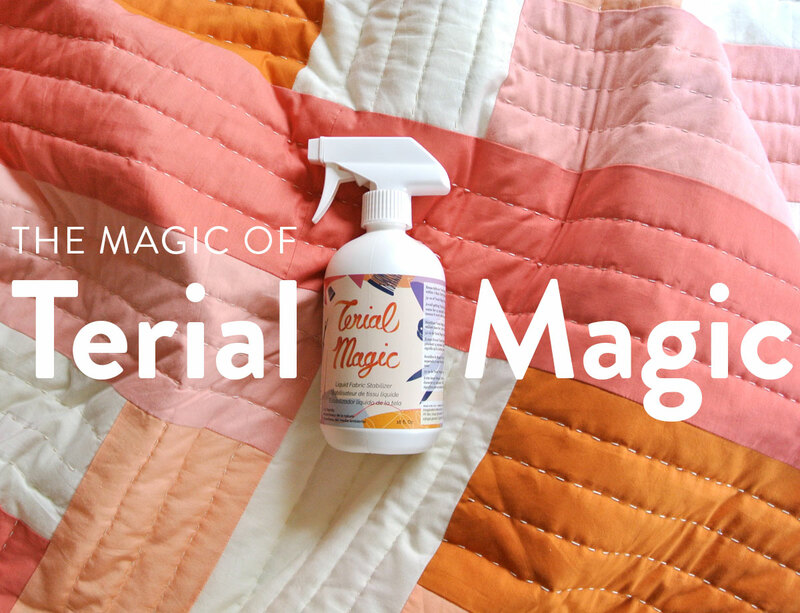 But I have a question: if Terial Magic washes out, won’t those labels fray after washing? You will need to either hem the edges or cut them on the bias to avoid fraying. Another option is to use a fabric that doesn’t fray, such as jersey. Hmm, where to start? The postcards? the orchids? the sewing machine cover (wait a minute… I never cover my machine because I use it all.the.time)? the labels! that’s it! The onesie project would be a fun small project to try! I am inspired to make the butterflies made from jeans and cotton fabric. My daughter’s bedroom has trees painted on the walls and those butterflies would make the trees cone alive and pop off the walls.